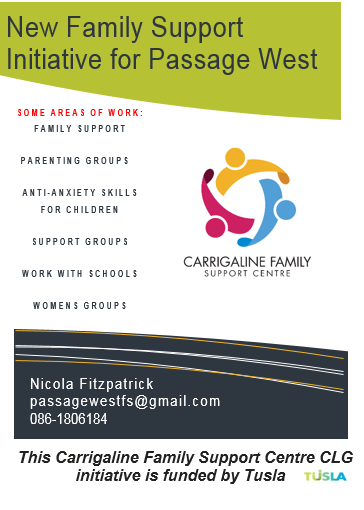 Supporting the people of Passage West, this new service was established in Sept 2018. In Oct & Nov 2018 a door-to-door survey was carried out with focus on looking at family support needs for the area and introducing the service to families. Many thanks to anyone who took part in the survey and for the ideas offered during that time. Registration OPEN Now for these two courses! ​The Playgroup for Passage West was set-up in Dec 2018. The group, which caters for 0-4 year olds, invites parents, guardians, grandparents and childminders to come along to meet others. The group is informal where people can drop in between 10.15am and 12.15pm on Tuesdays and enjoy a cup of tea/coffee and a chat with a €2 cost per adult to cover costs. There is music & toys for the children & the occasional speaker depending on group need. The hall is spacious and can facilitate entry by buggies and prams. Children must be supervised by parents at all times. Based in the PACE Centre Main Hall. Please access the Hall from the Library side, ample parking nearby. Contact: passagewestfs@gmail.com or 086-1806184 to come along!